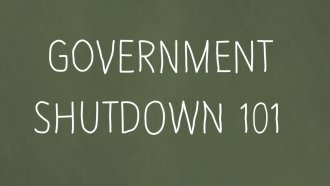 The government is set to shut down Friday at midnight unless Congress passes a stopgap spending bill. Tax reform isn't the only item Congress needs to debate this week. There's another bill that needs taken care of — fast. The government is set to shut down Friday at midnight unless lawmakers pass a stopgap spending bill. A House vote was expected as soon as Wednesday, but outlets report Republicans may delay it. House and Senate GOP lawmakers are fighting over Affordable Care Act payments, while Senate Democrats are expected to punt any legislation that doesn't include a deal for domestic programs in addition to defense spending. That said, one GOP lawmaker thinks congressional Republicans need to be prepared to stay in town until there's an agreement.